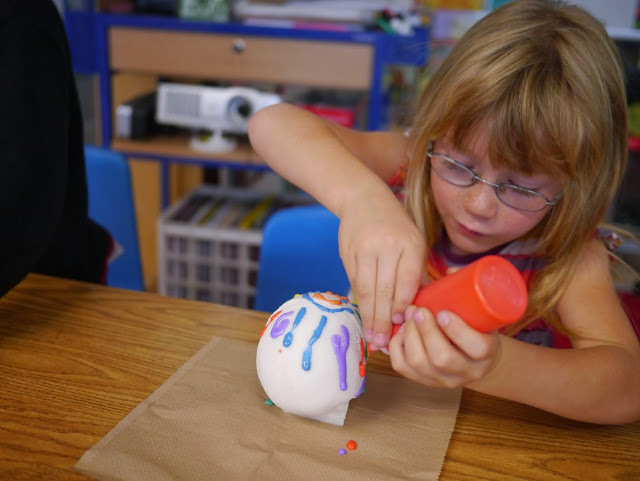 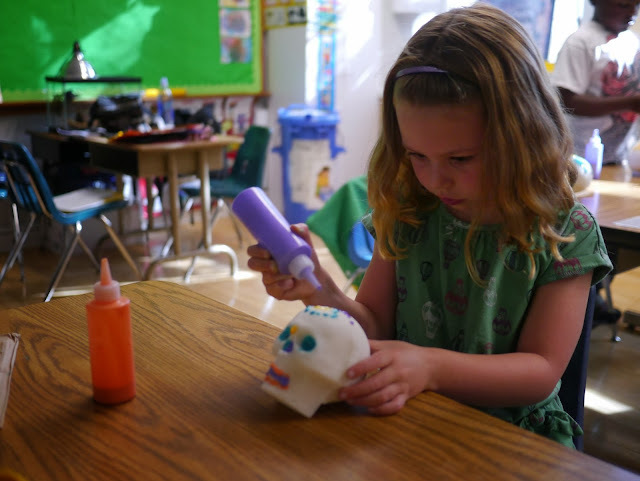 Today Ava's class at school decorated sugar skulls for their Day of the Dead altar. 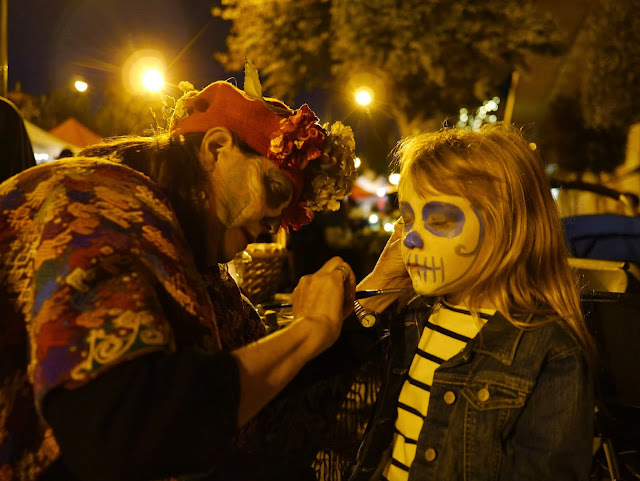 The Day of the Dead (Dia de los Muertos) is a Latin American celebration honouring those who have passed away. 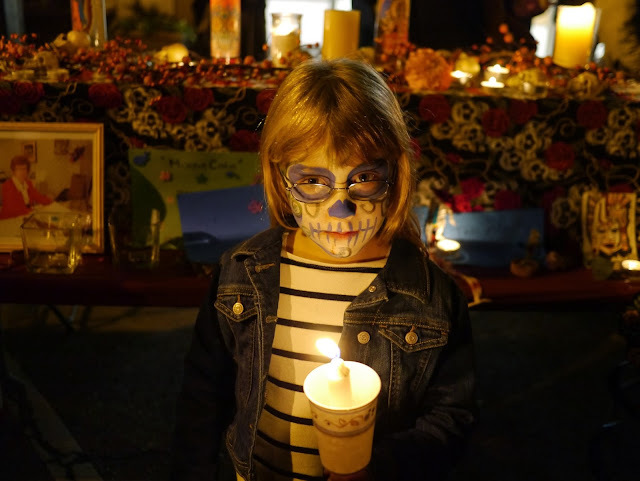 The holiday is celebrated with candle lit processions and altars dedicated to the deceased. 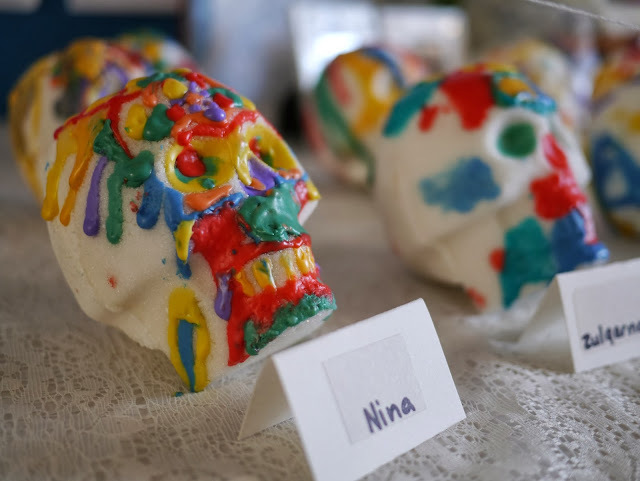 These altars are decorated with (among other things) candles, marigolds and sugar skulls. 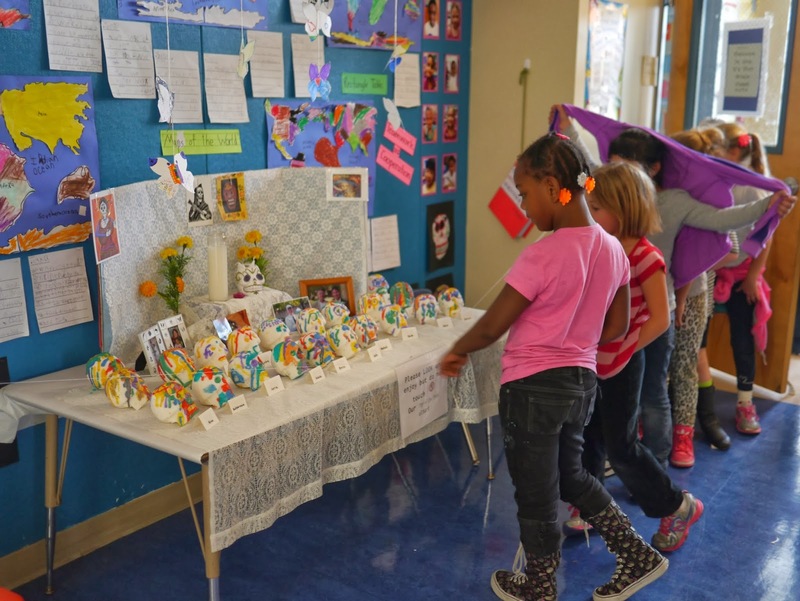 Ava's class has been learning about Day of the Dead and have created an altar outside their classroom. 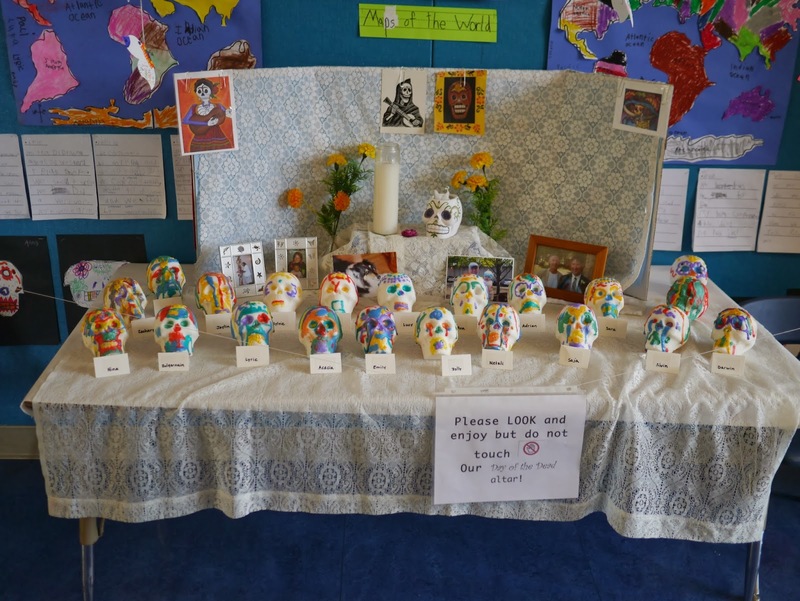 Today their altar was completed with the sugar skulls. 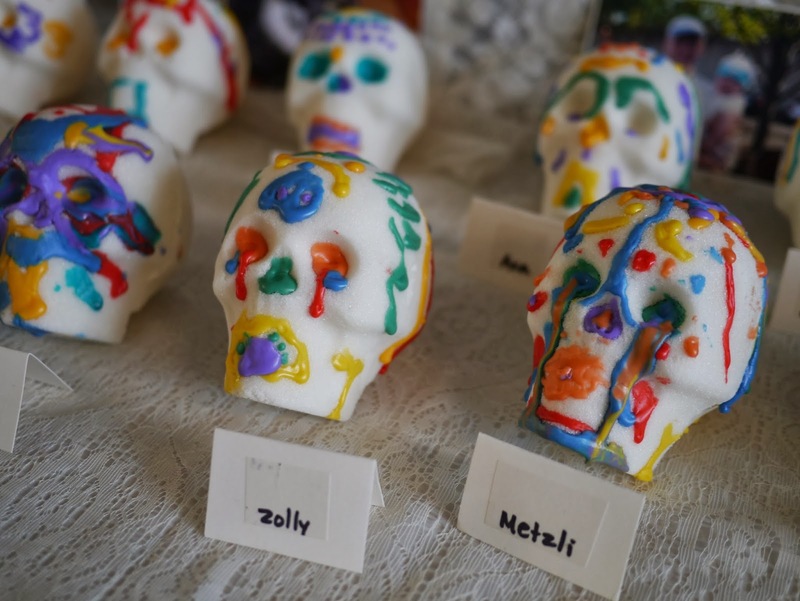 Sugar skulls were made in advance from a mould similar to the ones you can find here. 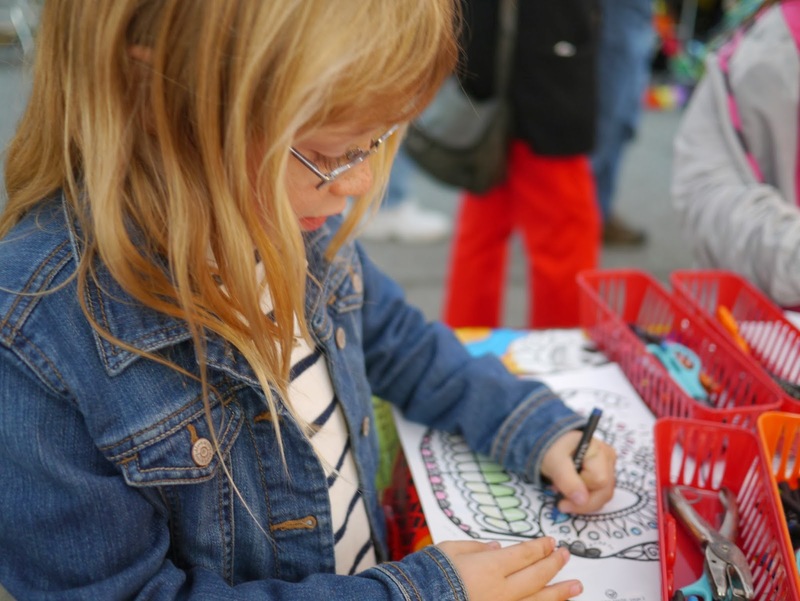 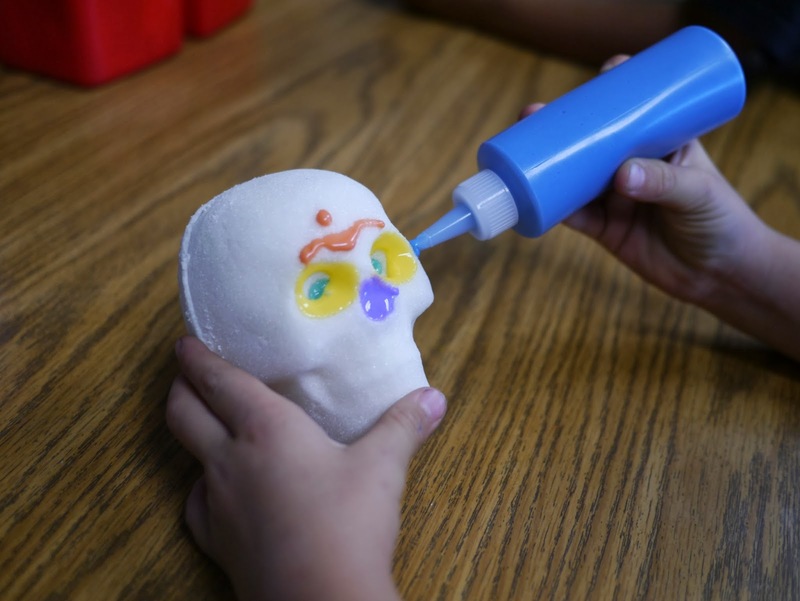 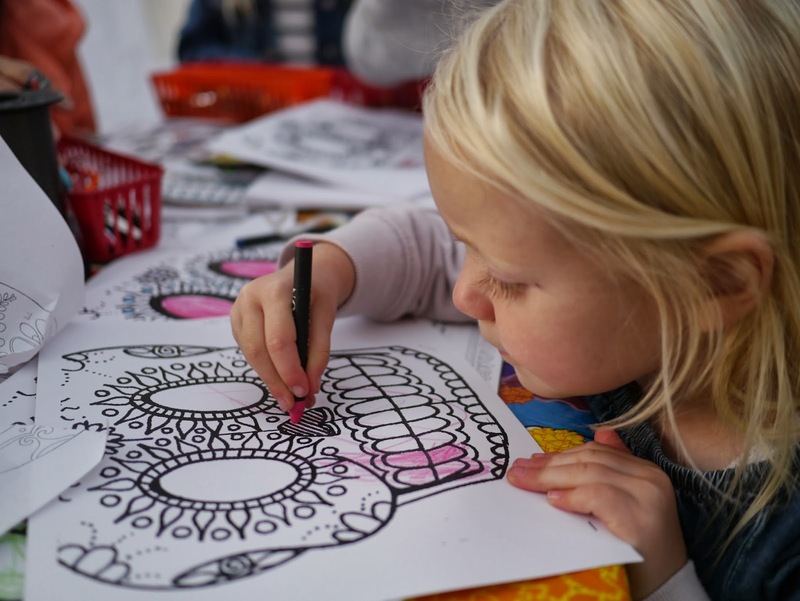 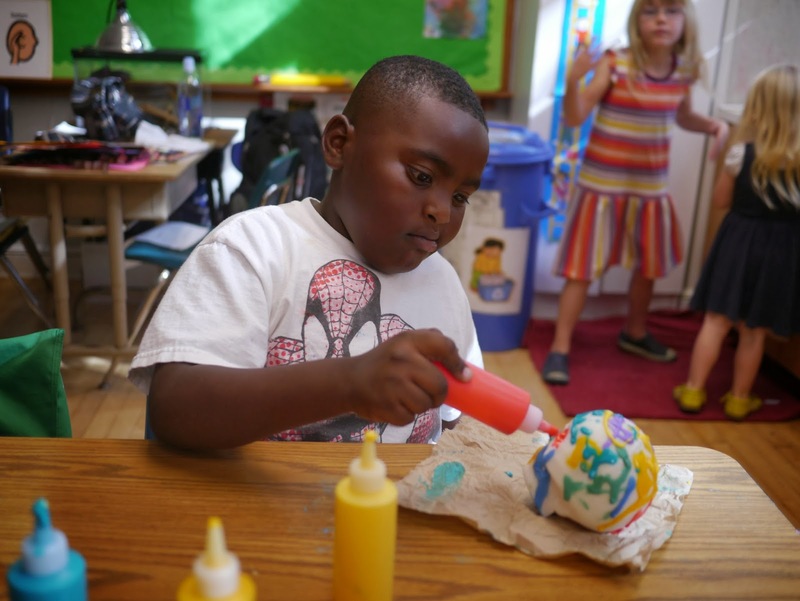 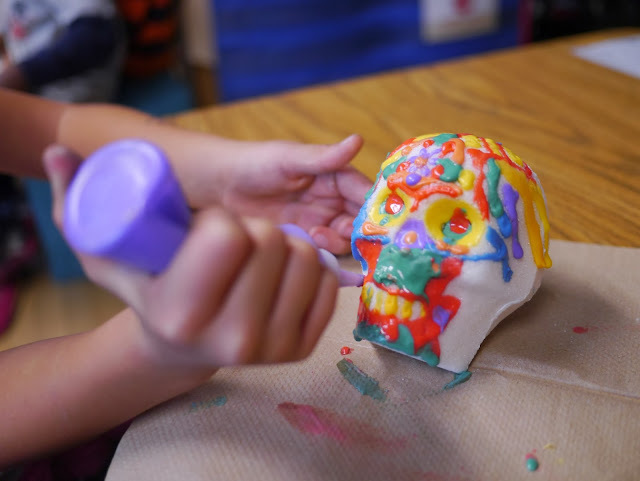 The kids were then provided with bottles of royal icing in bright colours to decorate their skulls. 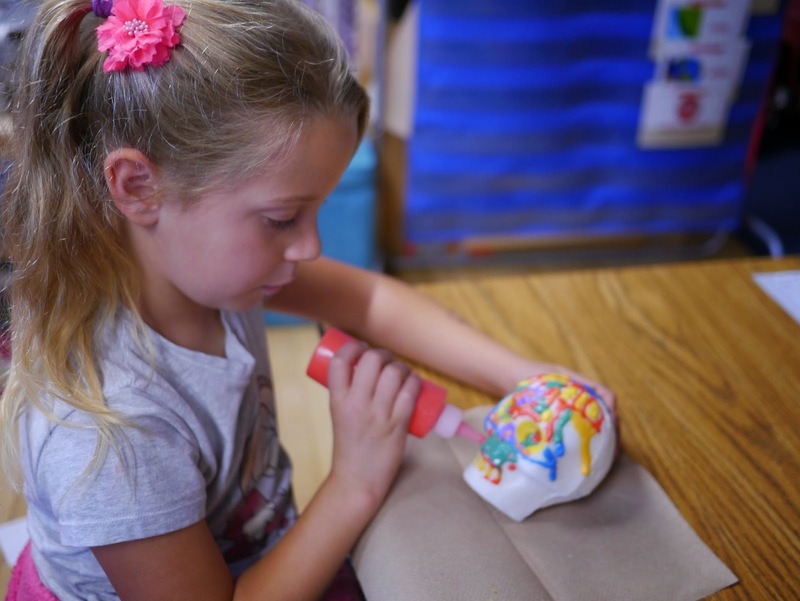 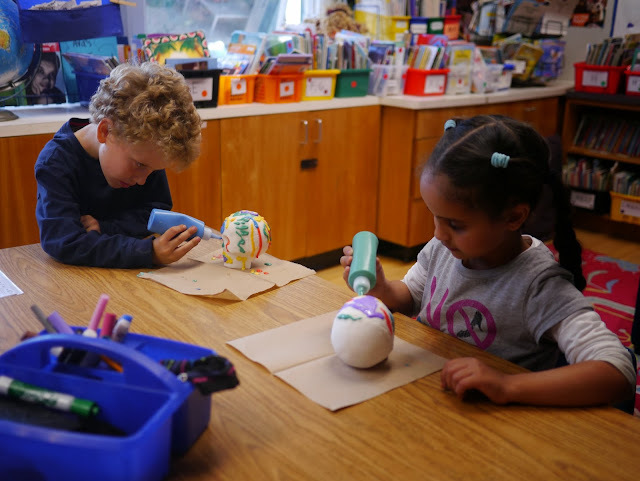 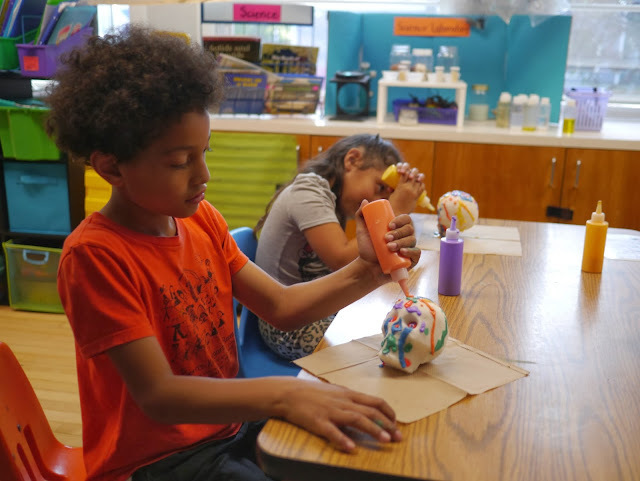 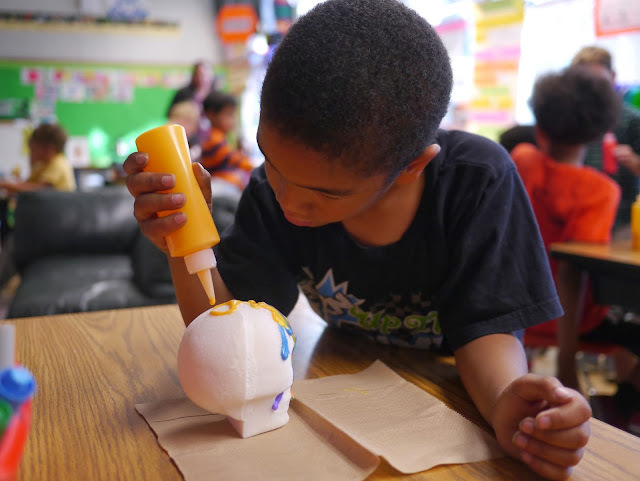 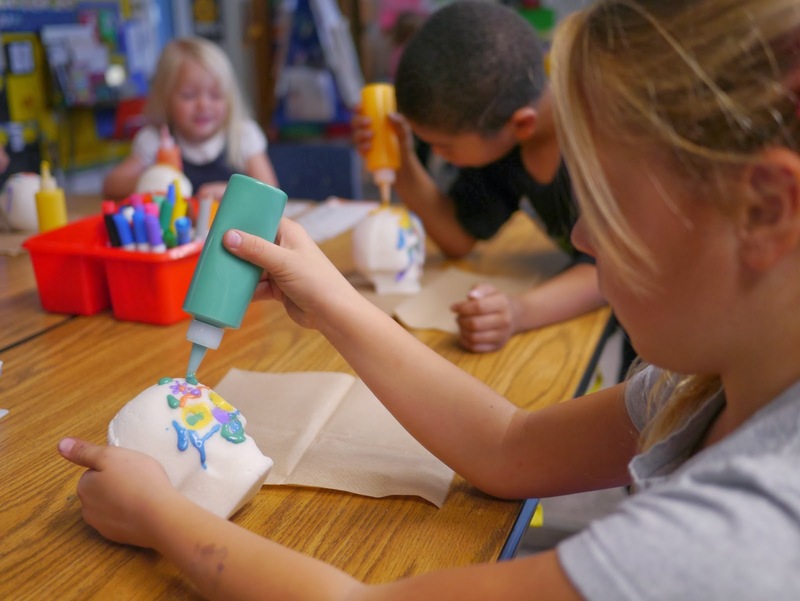 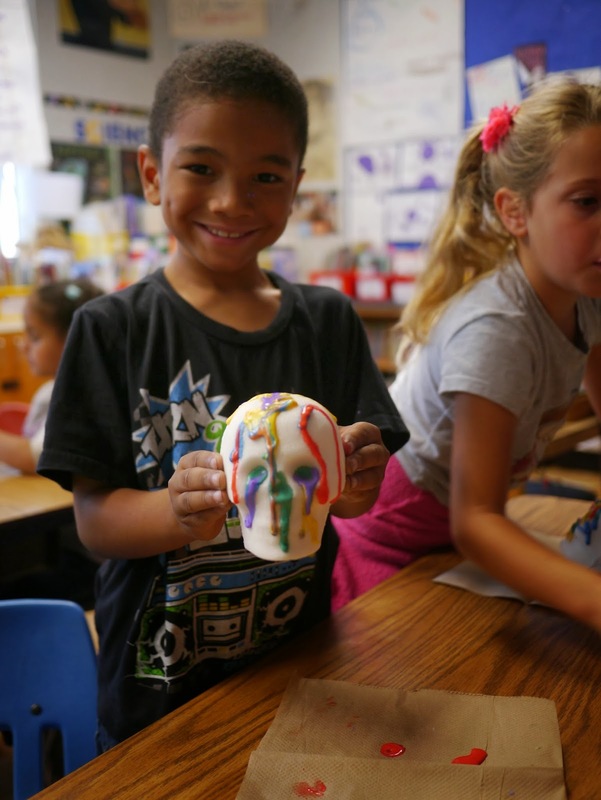 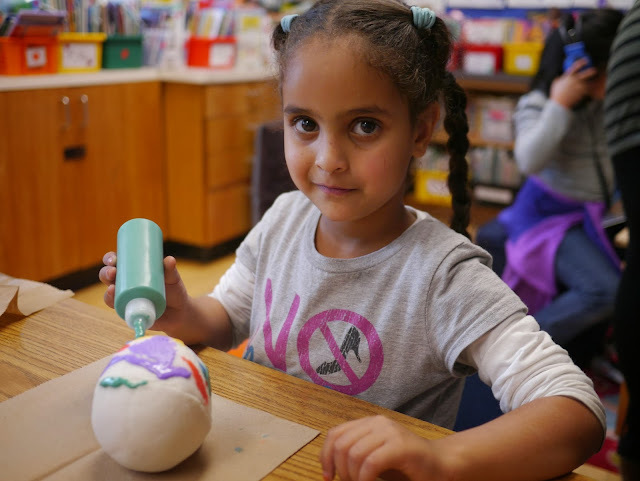 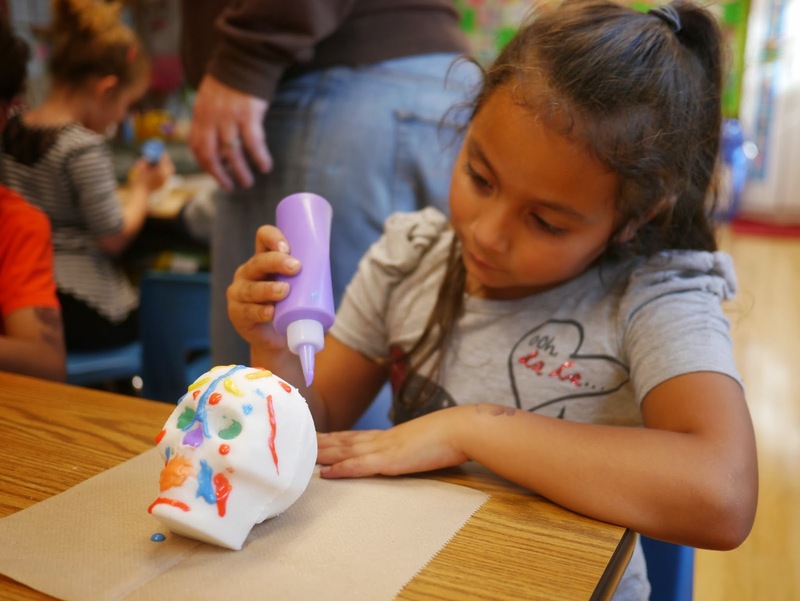 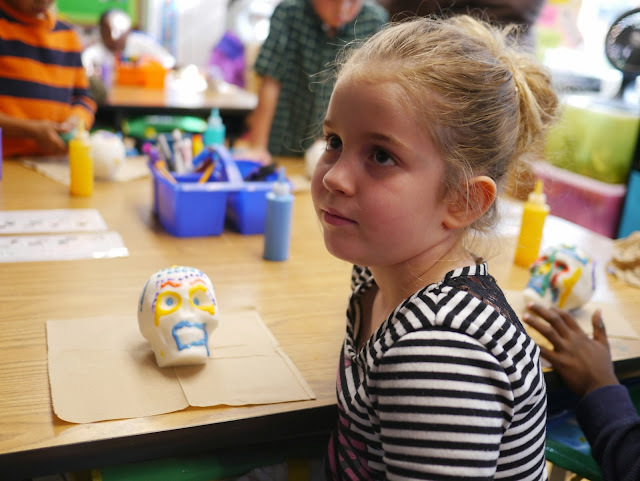 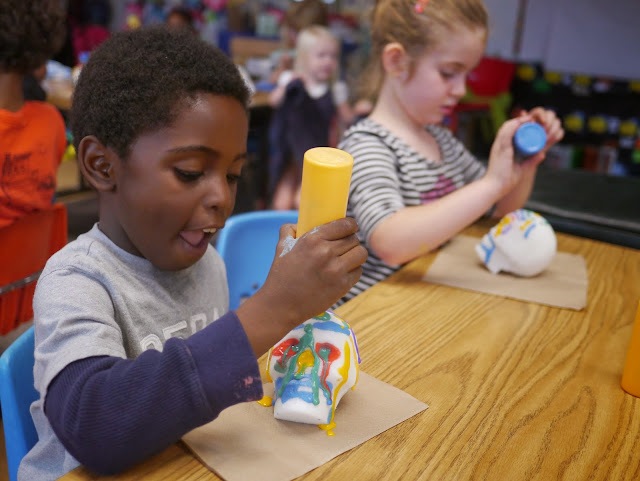 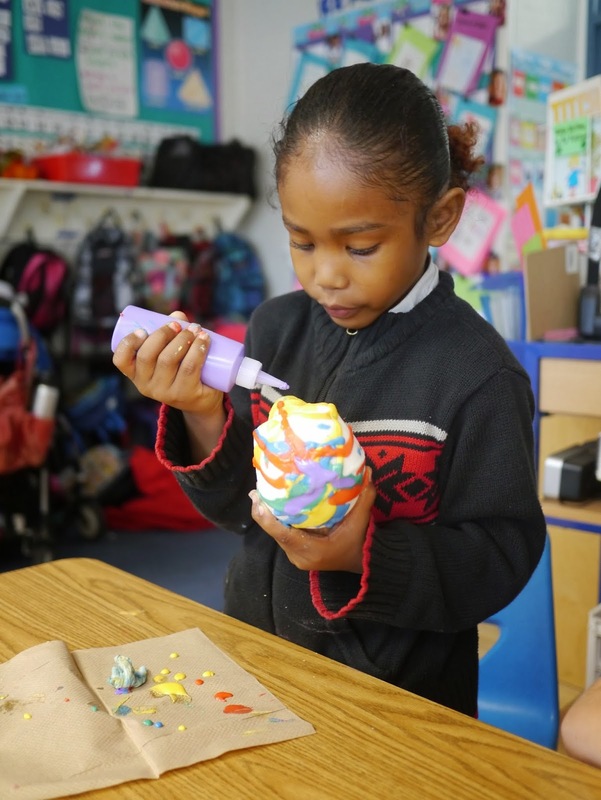 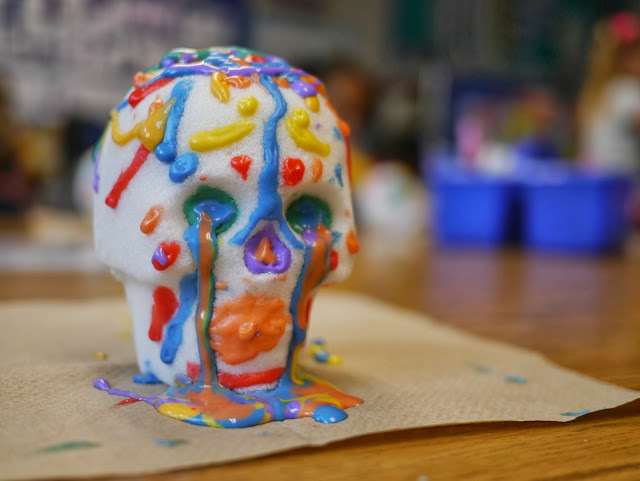 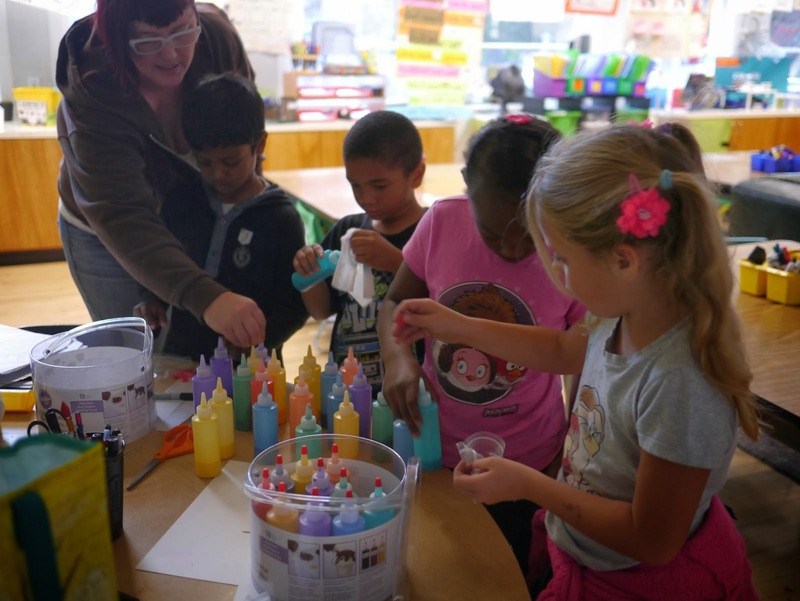 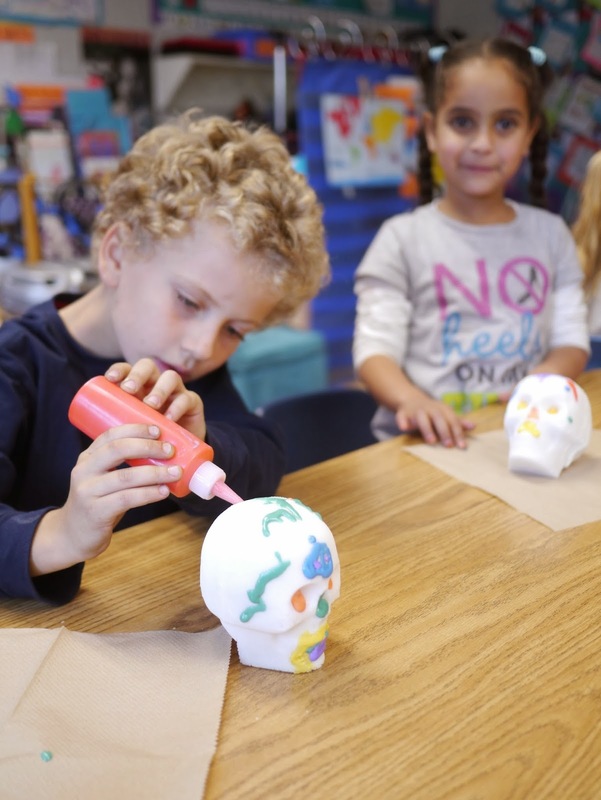 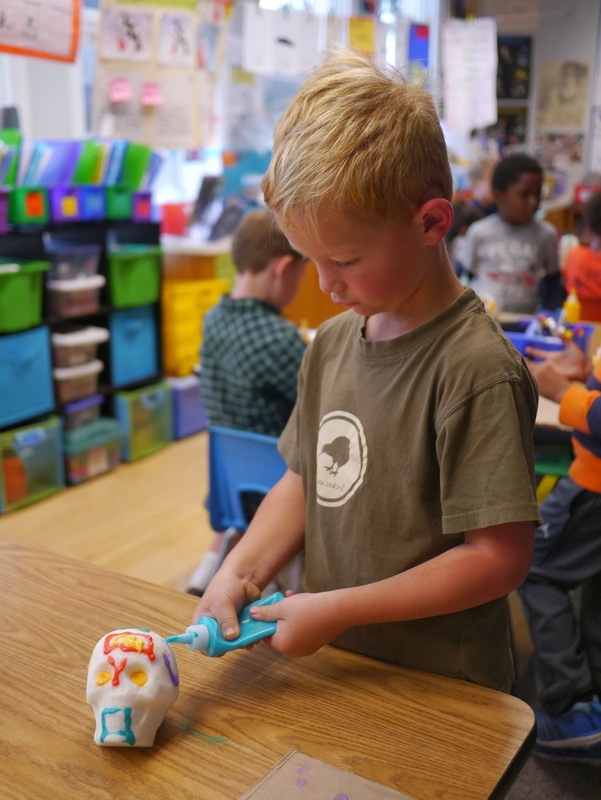 Their teacher spoke to them about symmetry and the traditional patterns that are used on sugar skulls for Day of the Dead. 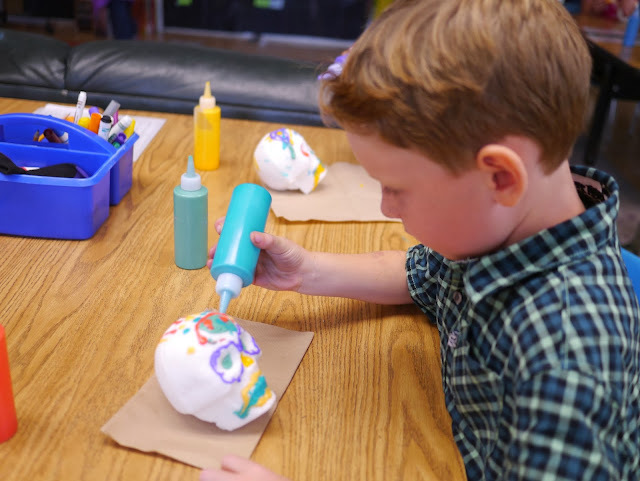 Most of the kids tried to stick to making their skull decorations pretty symmetrical but quite a few of the skulls ended up completely covered in a mess of icing! 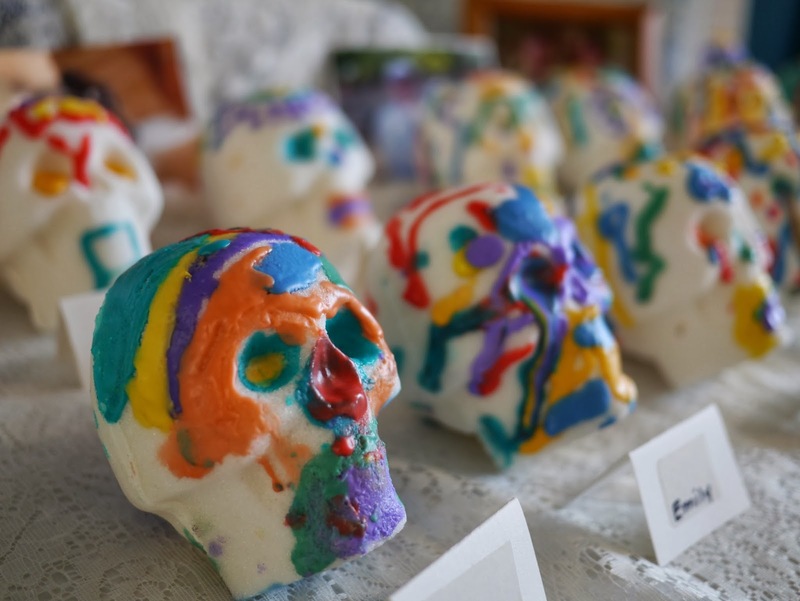 Everyone had fun and the skulls look fantastic together on the altar. The kids did a great job decorating their skulls and miraculously they made hardly any mess at all. They were all pretty helpful at tidying up afterwards while their teacher labelled their skulls and moved them onto the altar. 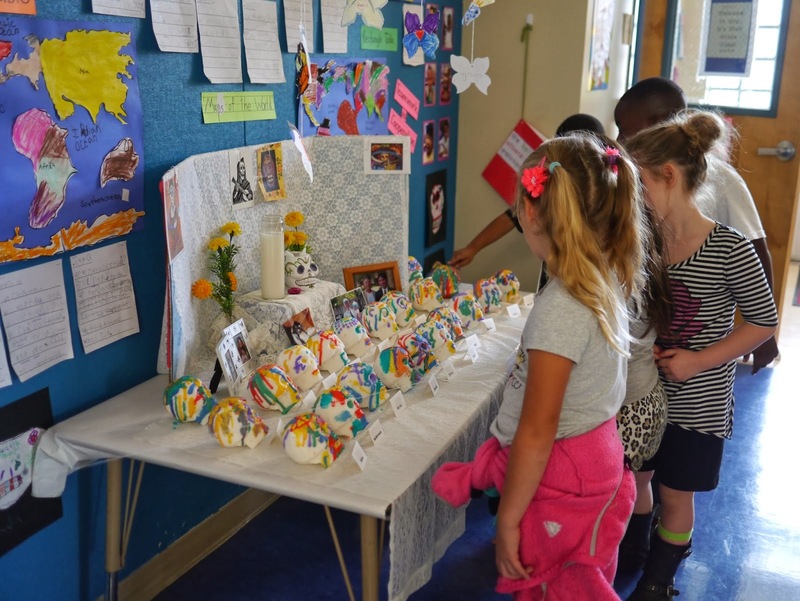 Once all the skulls were all in place the kids came out of the classroom to have a look at their altar. 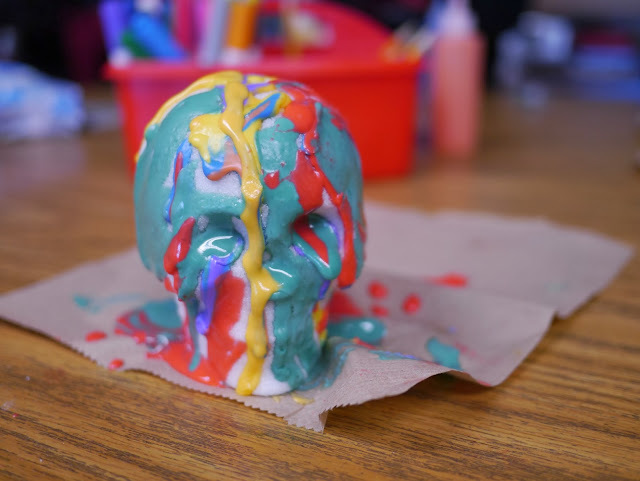 They were all pretty proud of what they created and I've got to say that all of the colourful skulls together look great. 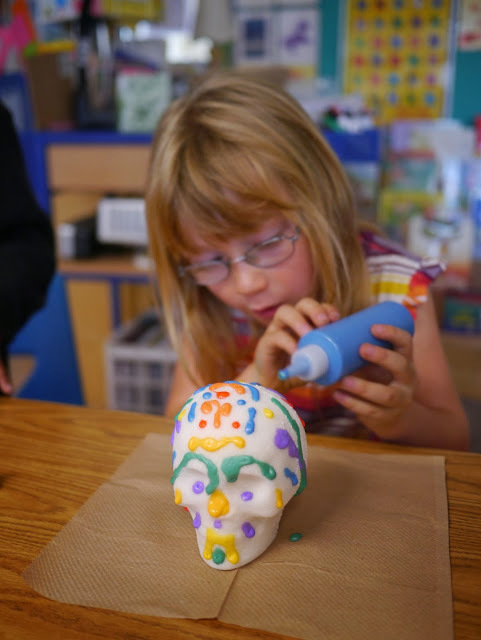 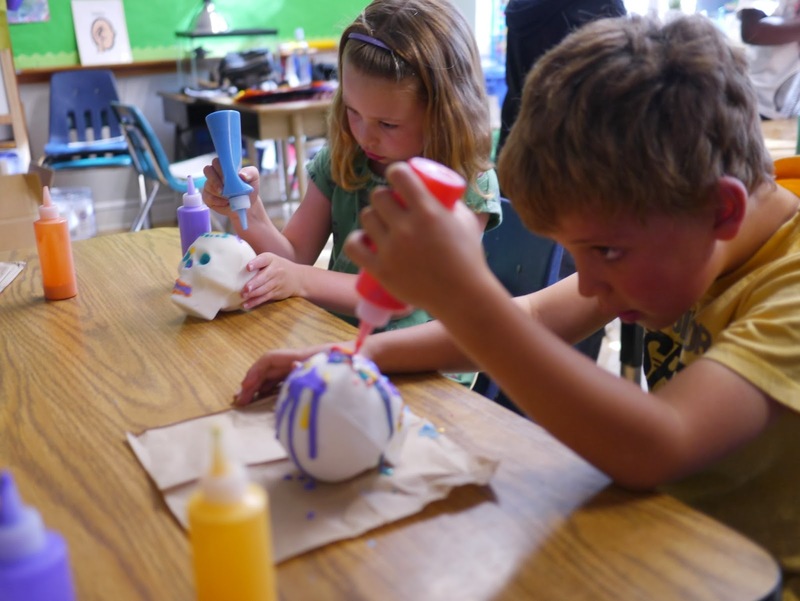 The sugar skulls were so much fun to make. I'm thinking of getting some small skull moulds and making skulls for the girls and their friends to decorate next year. 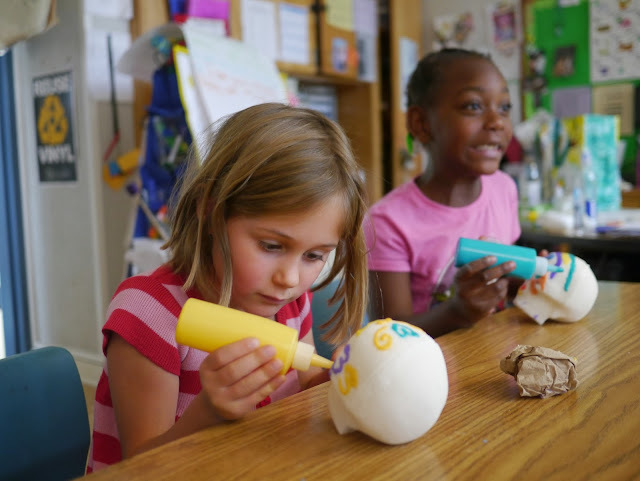 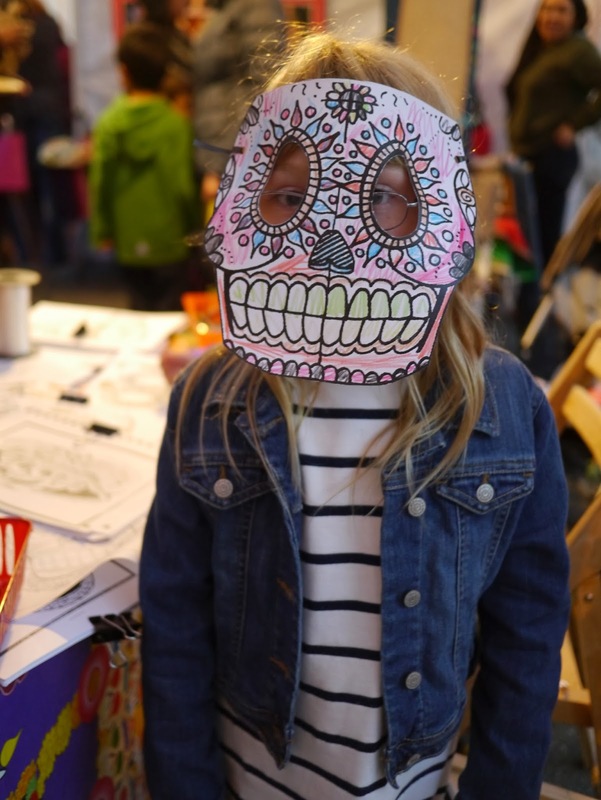 Last year we made paper skull masks with friends and the girls really enjoyed it. Oh, and one last Day of the Dead thing... last Tuesday there was a Day of the Dead festival held in Berkeley's Gourmet Ghetto. 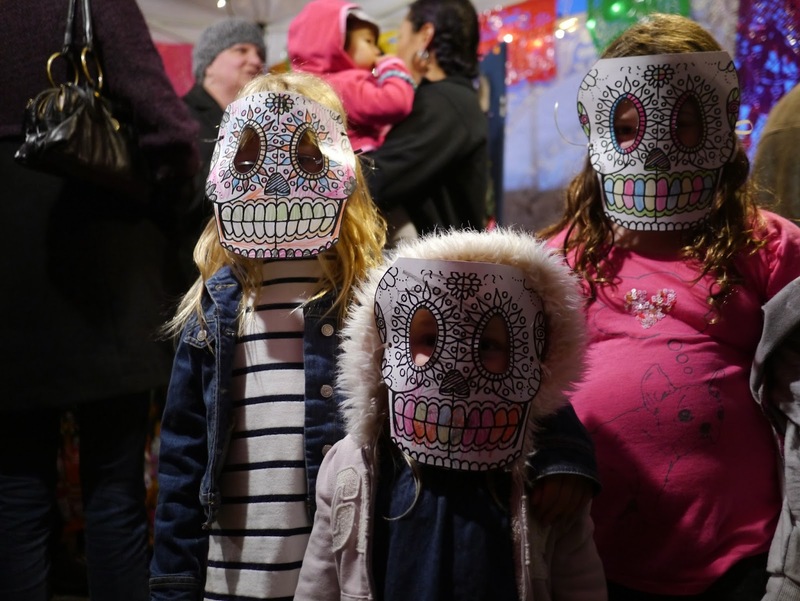 The girls coloured paper skull masks, Ava had her face painted like a skull, we watched Aztec dancers perform and we lit candles to honour the dead. Dr Lola's diagnosis... 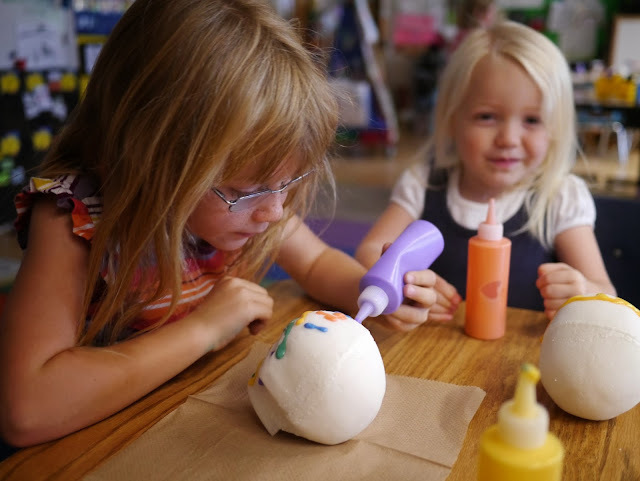 It's a baby!